SKU: SDS471. Categories: All Manual Toothbrushes, Butler GUM Manual Toothbrush. A revolutionary new toothbrush that utilizes new bristle technology designed to clean especially well and to reach places many other brushes can’t. Best of all, this brush is gentle on your teeth and gums so you get the most comfortable and soothing brushing experience. The Microtip toothbrush from Butler GUM is one of Sunstar Butler’s latest innovations. As soon as you take hold of it and make the first few strokes against your teeth, you will feel and appreciate the tremendous brushing power of GUM’s Micro Tips. Those people who prefer a toothbrush head that is filled with more thin versatile and soft bristles and has a fuller appearance and feel. This brush is great for those who enjoy soothing soft bristles that effectively clean below the gum line and between teeth. The typical user is a health conscious and style conscious adult that enjoys this toothbrushes ability to easily clean all the important (and usually hard to reach) surfaces in the mouth. For more information, pictures and reviews, please take a look below. Designed for a more sensitive approach to gum care. Clinically proven to reduce plaque below the gum line. Designed for soft, gentle cleaning over a broader surface. Aligns with the tooth profile to clean hard to reach places. 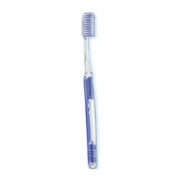 One of the first impressive aspects of the GUM Microtip tooth brush you should notice is the clear plastic handle. Yes – it will add to the décor of your bathroom and does provide a refreshing alternative to all the plain white toothbrush handles. On the back of the handle, you will notice two grips positioned perfectly to accommodate your forefinger and the bottom of your palm. your teeth a more comfortable experience. As you travel up the toothbrush, a thin and clear plastic neck emerges designed perfectly to help you reach your back teeth. With Gum’s Micro Tip Toothbrush, getting to all the problematic surfaces of your mouth is a “BREEZE” because the neck is longer and thinner than many other brushes and easily travels around your mouth to deliver an attack against plaque in all sorts of areas. The first impression many people get when they first look at the brush head of the Micro Tip Toothbrush is that it looks “bushy.” This “bushiness” is exactly what makes this toothbrush so effective. The Micro Tip Toothbrush has special multi-tip bristles so thousands of bristle tips can reach below the gumline and between teeth to remove plaque. 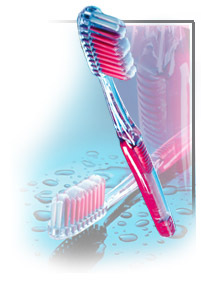 This tooth brush also has an interdental bristle trim designed to effective remove plaque between teeth. Finally, the raised center bristle design has been clinically proven to reduce early gum disease. 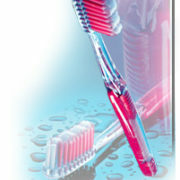 The bottom line is that the GUM MicroTip Toothbrush from Butler GUM is one of the most effective available.